Apartment renovations are exciting! Sometimes you’re renovating your entire space; sometimes you’re renovating one room or area. Regardless, your apartment renovation is a great way to personalize your space and be happier in your home. That said, renovations can seem overwhelming, especially in the aftermath of the construction. How do you deal with the mess left behind? 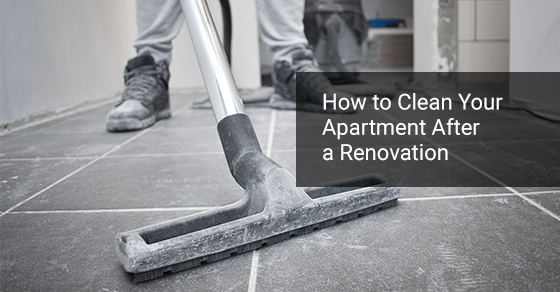 We’ve outlined the basic steps you should follow for an apartment cleaning after a renovation. Most of these are DIY, so it’s a good idea to enlist some help from friends and family members if you want to get the job done well, and as fast as possible. This should be the first step in your apartment cleaning. It’s easy to overlook the walls, but these surfaces are full of dust and potential hazards. There are different procedures to follow depending on how the walls were treated during the renovation. If the walls were newly painted, you should use a dry dusting method to get rid of any debris. Don’t wet the new paint right away. However, if the old paint job is still in place, you should wipe the walls down with some kind of damp cloth. To reach the high places, you should wrap your towel around a duster or a broom. When walls have been covered in a complexly textured wallpaper or natural materials, they should be vacuumed using a brush attachment. If you have smooth wallpaper, you should wipe the walls with a damp cloth and make sure you do adequate spot checks. Renovations come with a lot of debris, especially if you’ve been knocking down or constructing new walls, so you should go over your floors with your vacuum. If you have roll-out rugs, you should wash them. Carpeting should be vacuumed several times to get the majority of the debris up. Vacuums address the worst of the debris, but there are still tiny particles and bits of dust that sink deep into the floor. If your floors are tile, linoleum, or wood, you should go over them with a mop. If your floors are carpeting, you should rent a carpet shampooer and run it over the entire area. It’s helpful to do a full carpet shampoo of your space every few years, so if you haven’t done this recently, now’s a great time to get it out of the way! Your vacuum should have an upholstery attachment. Any furniture in the room was probably kept under plastic wrap during the apartment renovation, but it should still be cleaned. After you remove the plastic wrap, use the upholstery setting to clean the furniture, including hard-to-reach corners and the bottoms of cushions. Mattresses should also be vacuumed if they were in the renovation area. If there were any window treatments made of fabric or other fabric-based accessories, these should also get a run-down with the vacuum. Don’t shampoo the fabric, but make sure that your vacuum does a deep clean without being potentially harmful to the upholstery. If your light fixtures aren’t built into the ceiling, you should take them down and clean them. Replace any bulbs that need replacing. You don’t need to do this step if you have just had brand-new light fixtures installed; these should still be in pristine condition. If you have any ceiling fans, you should take the blades down and clean them. Use a dry dusting rag first, and then gently clean the blades with a damp and soapy cloth. Vents are often overlooked when people clean up in general, but it’s especially important to clean them after a renovation. If your vents are caked with dust, they’ll spew this dust into your living space. To avoid this, unscrew each vent and dust it. Then wipe it down with a wet cloth. The process is similar to the one you’ll use to clean your ceiling fan. You probably moved most objects out of the room during the renovation. If you have any non-upholstered furniture, you should wipe it down with a damp cloth. Any other items left in the work zone should also be wiped down. If the objects can’t be cleaned with a damp cloth, use a duster on them instead. It’s important to check on the air filters in your central air conditioning. When painters are working, they’ll sometimes remove the air filters so that they can get an even coat. Sometimes, they’ll forget to put the filters back on. You should make sure that your air filters are in place. If they need changing, now is the time to do so. Air filters should be replaced every three months or so, and post-renovation is a great time to get it out of the way. Missing filters might damage your furnace or central cooling system. If your filter wasn’t removed during construction, a replacement is still a good idea. It’s possible that debris and dust particles became trapped in the filter. At worst, this will decrease the quality of your air. At best, this will decrease your filter’s effectiveness. You’ve taken care of your floors, walls, and furniture. You’ve made sure that your air quality is the best it can be, cleaned your light fixtures, and dusted the blades of your fan. Now it’s time to bring your things back into your newly-renovated space. You’ll start to feel at home right away when you have your important objects back in the apartment with you. For more information on how to handle your home after a major renovation, call Avonlea Renovations at 416-907-4764 or contact us here.